Many of you will have read in the last week that unfortunately (though to no one’s surprise after seeing the data from the Planck satellite in the last few months) the BICEP2 experiment’s claim of a discovery of gravitational waves from cosmic inflation has blown away in the interstellar wind. [For my previous posts on BICEP2, including a great deal of background information, click here.] The BICEP2 scientists and the Planck satellite scientists have worked together to come to this conclusion, and written a joint paper on the subject. Their conclusion is that the potentially exciting effect that BICEP2 observed (“B-mode polarization of the cosmic microwave background on large scales”; these terms are explained here) was due, completely or in large part, to polarized dust in our galaxy (the Milky Way). The story of how they came to this conclusion is interesting, and my goal today is to explain it to non-experts. Click here to read more. Will the Higgs Boson Destroy the Universe??? The Higgs boson is not dangerous and will not destroy the universe. The Higgs boson is a type of particle, a little ripple in the Higgs field. [See here for the Higgs FAQ.] This lowly particle, if you’re lucky enough to make one (and at the world’s largest particle accelerator, the Large Hadron Collider, only one in a trillion proton-proton collisions actually does so) has a brief life, disintegrating to other particles in less than the time that it takes light to cross from one side of an atom to another. (Recall that light can travel from the Earth to the Moon in under two seconds.) Such a fragile creature is hardly more dangerous than a mayfly. Anyone who says otherwise probably read Hawking’s book (or read about it in the press) but didn’t understand what he or she was reading, perhaps because he or she had not read the Higgs FAQ. If you want to worry about something Higgs-related, you can try to worry about the Higgs field, which is “ON” in our universe, though not nearly as “on” as it could be. If someone were to turn the Higgs field OFF, let’s say as a practical joke, that would be a disaster: all ordinary matter across the universe would explode, because the electrons on the outskirts of atoms would lose their mass and fly off into space. This is not something to worry about, however. We know it would require an input of energy and can’t happen spontaneously. Moreover, the amount of energy required to artificially turn the Higgs field off is immense; to do so even in a small room would require energy comparable to that of a typical supernova, an explosion of a star that can outshine an entire galaxy and releases the vast majority of its energy in unseen neutrinos. No one, fortunately, has a supernova in his or her back pocket. And if someone did, we’d have more immediate problems than worrying about someone wasting a supernova trying to turn off the Higgs field in a basement somewhere. Did BICEP2 Detect Gravitational Waves Directly or Indirectly? During that wild day or two following the announcement, a number of scientists stated that this was “the first direct observation of gravitational waves”. Others, including me, emphasized that this was an “indirect observation of gravitational waves.” I’m sure many readers noticed this discrepancy. Who was right? Which Parts of the Big Bang Theory are Reliable, and Why? Familiar throughout our international culture, the “Big Bang” is well-known as the theory that scientists use to describe and explain the history of the universe. But the theory is not a single conceptual unit, and there are parts that are more reliable than others. It’s important to understand that the theory — a set of equations describing how the universe (more precisely, the observable patch of our universe, which may be a tiny fraction of the universe) changes over time, and leading to sometimes precise predictions for what should, if the theory is right, be observed by humans in the sky — actually consists of different periods, some of which are far more speculative than others. In the more speculative early periods, we must use equations in which we have limited confidence at best; moreover, data relevant to these periods, from observations of the cosmos and from particle physics experiments, is slim to none. In more recent periods, our confidence is very, very strong. In my “History of the Universe” article [see also my related articles on cosmic inflation, on the Hot Big Bang, and on the pre-inflation period; also a comment that the Big Bang is an expansion, not an explosion! ], the following figure appears, though without the colored zones, which I’ve added for this post. The colored zones emphasize what we know, what we suspect, and what we don’t know at all. Notice that in the figure, I don’t measure time from the start of the universe. That’s because I don’t know how or when the universe started (and in particular, the notion that it started from a singularity, or worse, an exploding “cosmic egg”, is simply an over-extrapolation to the past and a misunderstanding of what the theory actually says.) Instead I measure time from the start of the Hot Big Bang in the observable patch of the universe. I also don’t even know precisely when the Hot Big Bang started, but the uncertainty on that initial time (relative to other events) is less than one second — so all the times I’ll mention, which are much longer than that, aren’t affected by this uncertainty. 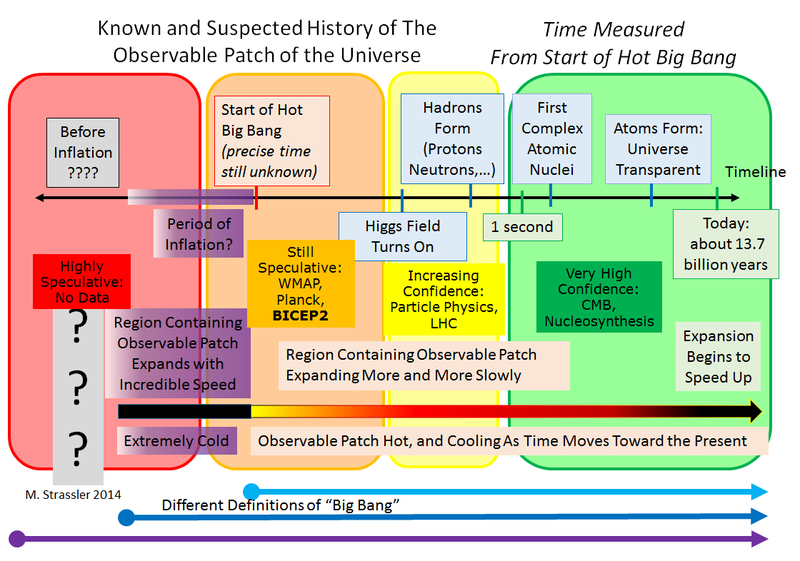 I’ll now take you through the different confidence zones of the Big Bang, from the latest to the earliest, as indicated in the figure above. Did the universe begin with a singularity? A point in space and/or a moment in time where everything in the universe was crushed together, infinitely hot and infinitely densely packed? Doesn’t the Big Bang Theory say so? Well, let me ask you a question. Did you begin with a singularity? Let’s see. Some decades ago, you were smaller. And then before that, you were even smaller. At some point you could fit inside your mother’s body, and if we follow time backwards, you were even much smaller than that. If we follow your growth curve back, it would be very natural — if we didn’t know anything about biology, cells, and human reproduction — to assume that initially you were infinitesimally small… that you were created from a single point! But that would be wrong. The mistake is obvious — it doesn’t make sense to assume that the period of rapid growth that you went through as a tiny embryo was the simple continuation of a process that extends on and on into the past, back until you were infinitely small. Instead, there was a point where something changed… the growth began not from a point but from a single object of definite size: a fertilized egg. Congratulations to my friend and colleague Sean Carroll, blogger at Preposterous Universe! For his book, The Particle at the End of the Universe, about the theoretical idea and experimental discovery of the Higgs field and its particle (the Higgs `boson‘), he has won the 2013 Royal Society Winton Prize! Not the 3 million that you get for being a famous string or field theorist, or the few hundred thousand that you get for inventing the [Anderson]-(Brout-Englert)-Higgs-(Guralnik-Kibble-Hagen) mechanism, but 25,000 pounds sterling will cover expenses for a few months. And more importantly, the recognition is well-deserved. Well done, Sean! For those who don’t know of him, Sean is a very fine scientist, an expert on the early and current universe, among other things, as well as a very skilled and engaging writer and speaker… and very importantly, he maintains very high standards for accuracy and clarity. I recommend him highly! Arguably the two greatest problems facing particle physicists, cosmologists, string theorists, and the like are both associated with an apparent failure of a notion called “naturalness”. Until now, I’ve mostly avoided this term on this site, because to utter the word demands an extended explanation. After all, how could nature be unnatural, by definition? Well, the answer is that the word “natural” has multiple meanings. The one that scientists are using in this context isn’t “having to do with nature” but rather “typical” or “as expected” or “generic”, as in, “naturally the baby started screaming when she bumped her head”, or “naturally it costs more to live near the city center”, or “I hadn’t worn those glasses in months, so naturally they were dusty.” And unnatural is when the baby doesn’t scream, when the city center is cheap, and when the glasses are pristine. Usually, when something unnatural happens, there’s a good reason. I’ve started writing an article about naturalness and unnaturalness, and how there are two great mysteries about how unnatural our universe is, one of which lies at the heart of the Large Hadron Collider‘s [LHC’s] research program. What I’ve written so far explains what naturalness means and (in part) how it applies to the Standard Model (the equations we use to describe the known elementary particles and forces). I’ll be extending the article to explain this in more detail, and to explain the scientific argument as to why it is so unnatural to have a Higgs particle that is “lonely” — with no other associated particles (beyond the ones we already know) of roughly similar mass. This in turn is why so many particle physicists have long expected the LHC to discover more than just a single Higgs particle and nothing else… more than just the Standard Model’s one and only missing piece… and why it will be a profound discovery with far-reaching implications if, during the next five years or so, the LHC experts sweep the floor clean and find nothing more in the LHC’s data than the Higgs particle that was found in 2012. 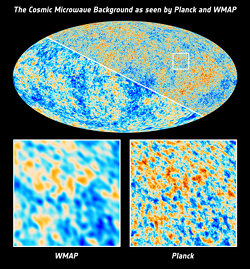 The big news overnight for science was the best measurement yet of the Cosmic Microwave Background [CMB], by the Planck Satellite. The CMB consists of microwave photons (particles of light with microwave wavelengths) that are the tell-tale leftover glow from the universe’s hot period, the Big Bang. These photons are almost entirely uniform across the sky, and consistent with a glowing object of temperature 2.7 degrees Kelvin (or Centigrade) [poorly written] above absolute zero, the temperature where everything moves as slowly as allowed by quantum mechanics. (Note added: A change of 1 degree Kelvin is the same as a change of 1 degree Centigrade, but absolute zero is 0° Kelvin and -273.15° Centigrade. Centigrade and Celsius are the same.) But they aren’t quite uniform! And those slight non-uniformities, which speak volumes about the universe, have now been read with the greatest precision ever achieved.